I know, I know, you don’t get it; You get along with everyone and have such good friends – so why does your relationship with food have to be so fraught, right? Despite your easy going disposition and popularity in your communities when it comes to food you two just can’t seem to get along. 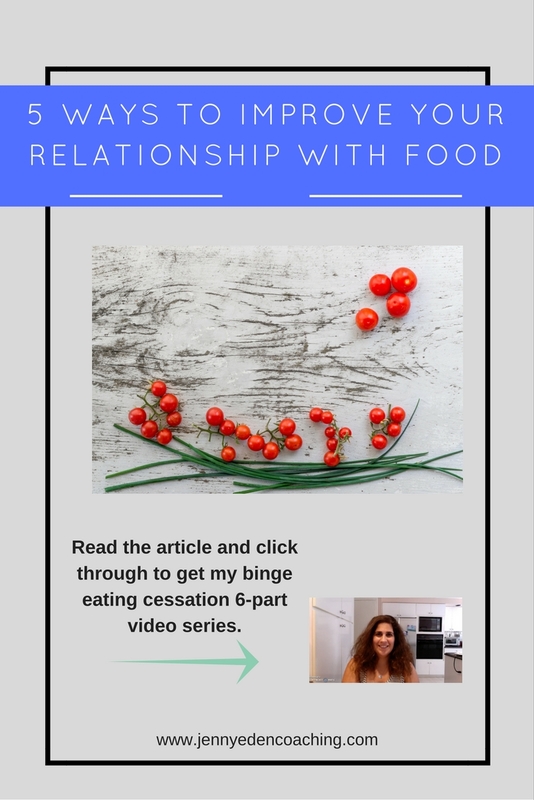 I want to be honest even though I’m considered a “food therapist” and work with people all over the world helping them to develop a better relationship with food, I didn’t always have such a healthy relationship with food myself. In fact, I struggled for most of my adult life. It wasn’t until the last 3 years where I finally turned inward and learned how to trust my own body wisdom, stopped chronic dieting and learned to have an amazing and joyful relationship with food. You can have this too! 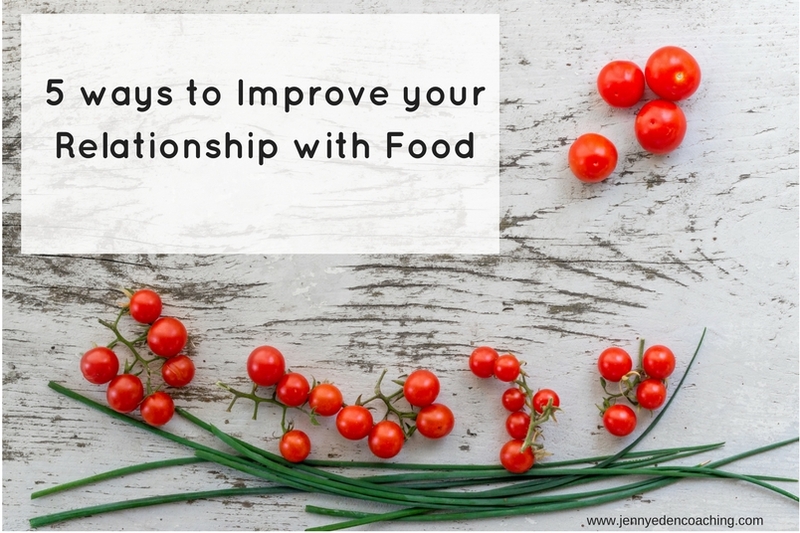 Let me share with you 5 ways to improve your relationship with food starting NOW! 1. Stop eating when you’re distracted! When you eat while driving, watching TV, or even surfing the internet, you’re not totally present or aware of eating. This can cause us to be also unaware of when we’re naturally full and can stop eating. It takes 20 minutes for our brains to get the message that its full. When you’re eating “on the go” or in a distracted way, it’s common to overeat. So, try making EATING the only activity. It will be hard at first but you can do it! Start with just a undistracted snack and go from there. 2. Get in touch with PLEASURE again. Guess what? As a species, humans seek pleasure and avoid pain. We’re so lucky to be a species where we can derive pleasure from eating and flavors….so take the time to savor your food and notice the different flavors and textures on your tongue. We have lived in a restrictive dieting culture for so long that many of us have lost touch with allowing ourselves to enjoy different foods without guilt! I’m giving you permission to do so! Let me know how it goes! 3. Choose macronutrient balanced foods – Aim to have a complex carb (veggie, fruit, whole grains) Lean protein (chicken, fish, eggs, tofu) and a healthy fat (avocado, nuts/seeds, full-fat yogurt, salmon) for every meal and snack. When you give your body what it truly needs in terms of balance, it will reward you with reducing the need to binge or crave or overeat. Even if you end up eating something more unhealthy – enhance that choice with some of the foods I just described. You can then have the best of both worlds because you get the treat you’re craving and you reduce your chance of binging more on that food because you’re buffering it with healthy enhancements. 4.Write a pleasure inventory. Write down every single thing that gives you happiness, joy and satisfaction big and small. Why? Well, when we eat sugary, salty, processed or fatty foods, tons of DOPAMINE is released in your brain, and the reward centers in the brain light up creating a feedback loop of you wanting more and more of that food. Employees in the food manufacturing business call this the “Bliss Factor” for the consumer and it’s why so many of us struggle! But guess what? We can actually generate our own natural dopamine! We can do it by pursuing lots of items on your pleasure inventory. This is an exercise that I do with my one-on-one clients and works beautifully. When they find they are struggling, they whip out their list and aim to do 2-3 things on that list. If, afterwards they still want that food, I give them full permission to eat it as long as they…. 5. Eat mindfully and own the decision! Put the said food on a plate or in a bowl. Sit down at the table and close your eyes. Take 2-3 deep breaths to get your body in a relaxation response and aim to chew 10-15 times before swallowing. Notice how your body feels before, during and after each bite. Put your fork down between bites. Enjoy and savor it! Let me know which of these you try and how it helps! In the meantime, continue the healing by downloading my 6-part video training on ending emotional eating.